A former diver with the Thai Navy has died after getting into difficulty on his dive out of the Tham Luang cave complex. Petty Officer Saman Gunan lost consciousness when he was navigating the narrow underwater passages after delivering oxygen tanks to the trapped soccer team – the boys have been stuck inside the caves for nearly two weeks now. PO Saman died after losing consciousness in one of the treacherous underwater passageways, according to Passakorn Boonyaluck, deputy governor of the Chiang Rai region. “His job was to deliver oxygen. He did not have enough on his way back,” Passakorn said, as reported by BBC. Saman’s dive partner attempted to revive the experienced waterman but was unsuccessful. The officer’s body was carefully extracted from the cave. The 38-year-old had left the Navy but returned to voluntary service in order to help aid the cave rescue operations that are currently ongoing. “Just adding to the heartbreak. What a heroic man. Rest In Peace,” one person tweeted. “No Greater than to sacrifice one’s life to save another. RIP Good Man,” another added. Despite this awful tragedy, those leading the rescue operation are insistent that Gunan did not die in vain, and that they will do everything in their power to bring the boys home safely. “I can guarantee that we will not panic, we will not stop our mission, we will not let the sacrifice of our friend go to waste,” said SEAL commander Admiral. Approximately 1,000 people are involved in the rescue operation, including navy divers, military personnel and civilian volunteers from several different nations. Officials are becoming increasingly concerned about the depleting oxygen levels inside the section of the cave where the boys are located. Oxygen was being greatly reduced by the large number of people working inside the cave network, according to the Chiang Rai Governor, Narongsak Osotthanakorn. Rescue operators are now working to install a 3-mile pipe through the cave to supply the group with air, as well as a fiber optic cable to connect the team with their anxious families outside. It is unlikely that the boys will be told of the death in order to keep morale up and to ensure they are motivated to make a successful dive out of the cave if necessary. Local groups have been scaling the surrounding mountain to hunt for other openings to the cave – they have yet to discover anything viable. 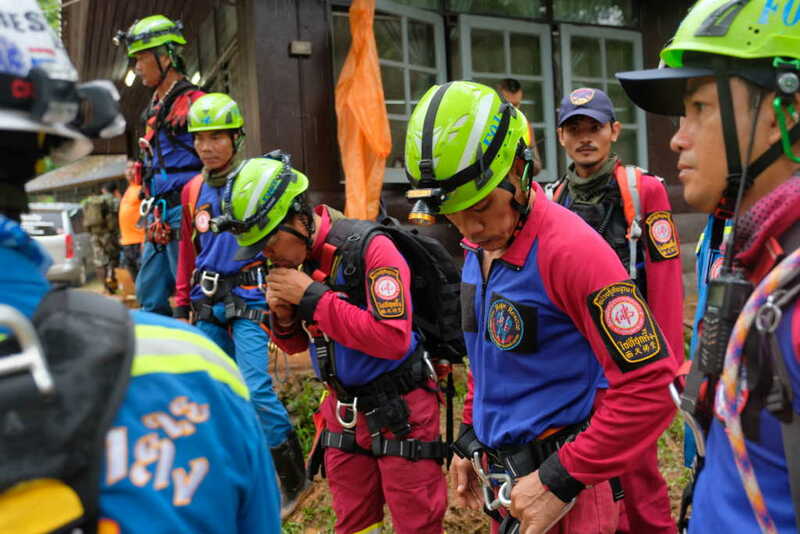 While experts initially thought it would be safe for the team to stay in the caves until the rainy season subsides, the increasing lack of oxygen and the rising water levels has made them think seriously about mounting a rescue operation sooner rather than later. In addition to this, if the rainfall is heavy, sinkholes and streams in the hills above could flood the chamber completely, which would obviously be disastrous. Right now, all 12 players, ranging in ages from 11 to 16, and their 25-year-old coach are stuck in the cavernous belly of the Thuam Luang cave complex, where they’ve been trapped since Saturday, June 23. Their perilous predicament is the result of an “initiation” ceremony, where the young players traveled deep into the lengthy tunnel, hoping to scrawl their names on an inner wall, then venture back out, according to diving instructor Ben Reymenants, who is working to save the youngsters. The kids are roughly half a mile beneath the surface of the earth and more than mile away from the mouth of the tunnel that led to the damp and cavernous space from which they have so far been unable to escape. The team was miraculously discovered after being lost for 10 days when a team of British rescue divers finally found them. Now that the children have been found alive, a massive team of first responders — including expert divers, medical staff, and law enforcement officers — are working around the clock to help bring the bunch to safety. Among all those working to save the soccer team, two medical professionals — a doctor and a nurse — have volunteered to stay in the cave with the kids, tending to their medical needs, for as long as it takes — days, weeks, or even months. And on the spiritual front, some of the players’ classmates are rallying at the mouth of the tunnel, where they are lifting the children and their coach up in prayer and song. “Believe in God. Only belief can move a mountain,” the kids declared in a song. “We are here to pray and sing for them,” one classmate told the Australian Broadcasting Corporation. “We want our friends inside and rescue teams to know that we are sending our support. Though the children are too weak to even attempt an escape at the moment, according to a Thai Navy SEAL with knowledge of the situation, the youngsters could eventually be forced to don full-face diving masks to navigate the treacherous and extremely narrow tunnel, which amounts to a six-hour journey. If they are, however, able to sufficiently drain the water before the storm hits, the children would ideally be able to walk out. If the storm comes, though, before the children have been brought to safety, they could potentially be forced to remain in the cave for months. Please continue to keep the soccer team, their coach, the medical experts, the rescue divers, and all the other first responders in your prayers.